There is a saying in French that goes : il n'y a que les imbéciles qui ne changent pas d'avis, meaning only idiots don't change their mind. Judging by this saying, I am no idiot because I do change my mind (very) often. 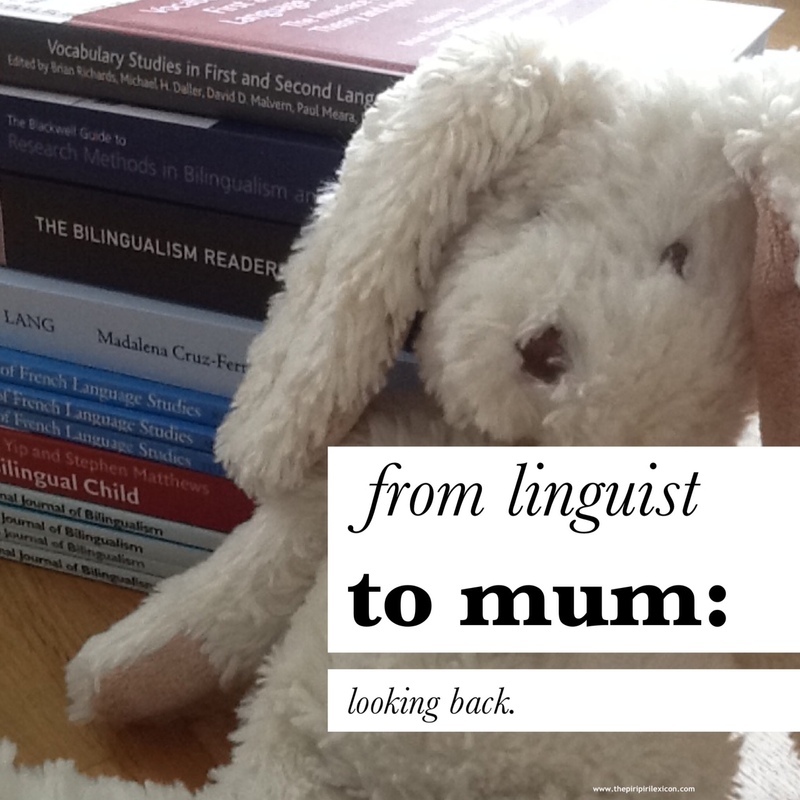 When it comes to language acquisition and raising my daughter multilingually, my views, opinions and decisions have changed quite a bit since she was born. This is due to two things. Firstly, as any mother or parent, you imagine how life is going to be with your first born, you dream of things (good or bad) but reality is often far from that image you had. Secondly, before I had my daughter, I was a researcher in language acquisition. As such, I had a good knowledge of what the theories behind the development of multilingual kids were. I had, however, very little hands on experience. As a researcher, I spent 4 years working on young bilinguals' vocabulary development. I studied and followed 13 families for about 18 months. I got to know the children quite well but only on paper. I only met them a couple of times each. All of my linguistic data, that formed the basis for my thesis, was derived from recordings parents made for me during their daily life. Therefore, I knew the theory well. When I became pregnant, I had a fair bit of preconceived ideas as to what I wanted to achieve and how we, as a family, were going to achieve it. Before LJ was born, we discussed our options and decided on a loose version of the OPOL (one person-one language) strategy even though P was not entirely convinced 3 languages were necessary. As we lived in England, his Portuguese was declining fast. He was not using his mother tongue any more (apart from a few conversations with his family back home once a week). After a few well rehearsed arguments, I managed to convince him. As soon as my little one was born, speaking French to her came naturally and I am not sure I could have done it differently anyway. P mixed and switched from the beginning between English and Portuguese even though I encouraged him not to. We settled into this little routine of 3 languages pretty easily and never really questioned any of it. As a researcher though, some things I had encountered in the literature and written about in my own work, remained in my mind. Looking back, these principles you read in textbooks (or in my thesis) are just far from reality based on idealistic assumptions. They, often, are a monolingual's view of the multilingual community. Here are some of the things I took for granted as a researcher but cannot really identify with on a personal level. Parental strategies are everywhere in the literature about multilingual children. Most of them are not well documented at all (if acknowledged at all). Researchers mostly study the one parent one language strategy or, more recently, the home/community strategy (where kids speak one language at home and learn the other one outside of home). In reality, there are so many types of multilingual families that it is almost impossible to classify them. Many recommendations about how to raise multilingual kids rely on this OPOL strategy. Yet, I am not sure that recommending a strategy to families or telling them one works better than another one is not (always) very helpful. I strongly believe that people should do whatever they feel comfortable with and feels natural. Showing them and explaining how different strategies work, yes, of course. But then one has to show them not just one, but multiple options. We know so little about how language develops in more complex situation (like our current 4 languages set-up). But that doesn't mean it does not work. In my study, I asked families to quantify how much time their child was exposed to each language. I tried to do it for LJ, last week. It is impossible! A lot of research relies on parents telling researchers how often their children hears each language, so they can have an idea of language dominance and balance. A lot of their results, then rely on those estimates. This is actually a very tricky exercise, even more so for 4 languages. How can you account for the amount of time spent with both parents (speaking 3 languages)? How can you tell if, when your kid is in school or daycare, whether they are playing with their friends in English or listening to a teacher speaking Spanish? How can you tell, when your child is playing by themselves, what language they are thinking/playing in? I, now, realise those numbers families gave me could have been so wrong and nobody has come up with a real alternative yet. You hear everywhere that children are sponges and as long as you are consistent and stick to your beliefs they will learn. Well, yes, but they also need to have a need for each language and it takes a lot of hard work on the parents' side too. Multilingualism is a family effort. Many parents will recognise that. Because P speaks Portuguese to our daughter, doesn't mean she is speaking it to him. She has no need for it. He understands French and she knows it! Researchers are, unfortunately, not often interested in the wider context and what parents do to help their children's multilingualism (apart from sociolinguists maybe). Even if most linguists agree that code-switching is a very complex process and is not a sign of laziness or low competence (in most cases), it is still widely believed that code-switching impedes on young children's language development. Most professional advice still goes against code-switching. My attitude towards cod-switching is now a much more relaxed one. I now thinks, that if this is something parents live with in their daily lives, children will learn to differentiate amongst situations when they can and cannot do it. I wrote more on that topic here. The scientific literature is often based on an underlying assumption that balanced bilinguals are the ideal bilingual subjects. Both languages should be, as far as possible, to a similar level. This is nearly impossible, in practice, even more so when you are dealing with more than 2 languages. And what if my child uses her Portuguese only to speak to her Grandma in Portugal? What if I struggle to speak about my research in French? Languages have purposes and uses. Multilinguals often prefer one of their languages to speak about a specific topic. French is my language for children. I struggle(d) speaking to new babies and kids in English. I knew nothing of baby-related vocabulary in English.In the great scheme of things, it probably does not matter. Every language acquisition researcher should have children and remember what these children do/did. I think this is even more important in multilingual acquisition. It is like reading or writing parenting books and having a baby in your hands: not quite the same thing. It makes as much sense to ask your doctor for advice about bilingualism as it would to ask him about your car. Harding & Riley. 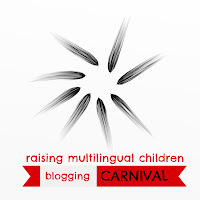 This post was written as part of the blogging carnival on raising multilingual children. If you haven't checked us out yet, please do so here. We are group of parent bloggers who get together virtually once a month and share our latest thoughts, errors and achievements about raising out kids multilingually. Come and join us, even if you are not a blogger. This month's carnival is hosted by Multilingual Mama. You are right about the balance thing. Most studies don't look at balance over time anyway (mainly because it is time and resource consuming). Yes, yes, a thousand times yes! I was feeling so frustrated because of all the "if you plan and do it right, then you will have success" philosophy that is so prevalent in parenting. Except, we can od thigns right and still fail to get the result we want. We can do it all wrong and still raise good children. The same goes for multilingualism. And, yes there is no one method to raise children, multilingual or not. Families adapt their methods to their current situation and when children change, the parents change as well. Love love love this post and thank you! I was wondering what you think the reason is for the lack of varied research? Aren't there enough researchers out there? Not enough time? Is it just too difficult? A lot of people now seem to be questioning the state of research in bilingual language acquisition. Do you think the the quality and breadth of research is going to change any time soon?